Mary was born and raised in San Carlos, California. She began her studies at UC Santa Barbara (UCSB) in 2013. 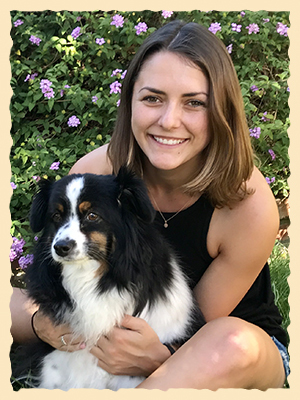 Once she achieves her goal of graduating UCSB with her degree in Biology, Mary then plans to go on to veterinary school. With this in mind, Mary joined FPH in January 2017 with a keen interest in learning and experiencing as much as she can about small animal and exotic veterinary medicine. Mary is very enthused to have joined FPH's staff as a part time veterinary assistant. When you meet Mary, she is calm, poised, eager to learn and help, while possessing a warm, caring and supportive style. All our staff enjoys working with Mary. With her quick learning and strive to experience all she can, Mary has been able to immediately contribute and assist with FPH's goal for excellence in patient care and service. As with all our FPH staff, Mary has numerous tasks and functions as a veterinary assistant. With her attention to detail and diligence to learn, it is quite obvious she will be a huge asset to FPH and all we are trying to accomplish for our patient's and client's well being. As a big plus, it is readily apparent that the pets gravitate to Mary as much as she does with them. They really respond to her personality and caring. Some of Mary's tasks include the following: Assisting Dr. Gray with examinations and patient procedures; assisting the other staff with patient care and treatments; assisting with anesthesia and surgeries; taking x-rays; performing in-hospital lab tests; filling prescriptions; providing for patient care and comfort; assisting clients upon checking in and out; answering phones; handling clients questions and concerns; various front office duties; and maintaining hospital cleanliness. When she is not working at FPH and attending school, Mary is very active playing soccer. Mary has enjoyed being part of the UCSB Club Soccer team for four years. In fact, she is the captain of this year's team, and they are the National Champions! On the occasions when she is not playing soccer, Mary is likely to be found outside hiking, running, camping, paddle boarding, kayaking or at the beach with friends. For pets, Mary grew up with a menagerie. She had various cats, guinea pigs, and dogs. Her current dog Raven is a miniature Australian Shepherd. Mary was present at her birth, and they are very close. Even now, while Raven is a bit older, she still loves to play with Mary's ever present soccer ball, and go to the beach.